Last weekend, Saturday, precisely, the immediate past Governor of Rivers State, Rotimi Amaechi, visited Port Harcourt, where he told his party's loyalists that, he won't appear before the probe committee set up by the sitting Governor, Wike Nyesom, that the committee is illegal and now, like in the movies, (action films, featuring da Rock), lol, Wike has come for Amaechi, kicking him on his stomach and dragging his ears, Wike said to him, listen man, playing media trial, to gather sentiment, won't work, go and defend yourself before the judicial commission of inquiry sitting in the State. Adding that, it was wrong for the former governor to describe the commission as illegal even when the court had ruled that the panel was in order. The governor, who spoke on Sunday through his Special Adviser on Media and Publicity, Opunabo Inko-Tariah, said he would not take issues with Amaechi over the setting up of the judicial commission of inquiry. Wike stressed that it was necessary for Amaechi to defend himself on certain issues concerning how the state was managed during his tenure. The incumbent governor recalled that a former governor, Dr. Peter Odili, appeared before a panel of inquiry. Wike had set up the panel to probe the sale of state’s assets and other related matters by the immediate past administration. Wike explained that, the former governor was put to shame when the court pronounced that nothing was wrong with the setting up of a judicial commission of inquiry to probe the immediate past administration. "It is laughable that Amaechi would call a panel that has already been declared lawful by a court of law illegal. This means that as of when he questioned its proprietary in court, he thought the court would declare it illegal but was shamed. 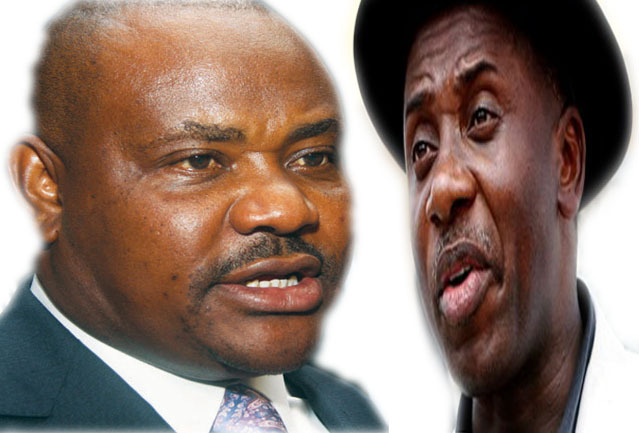 "This is no media trial and the government (Rivers) will not be embroiled in any war of attrition. He (Amaechi) should go and defend himself just like Dr. Peter Odili did during the Kayode Esho panel." Wike said. He, however, dismissed the allegations against him by Amaechi, adding that trying to whip up sentiment in the media will not help the former governor. "Media trial will not vindicate him as the sentiment he is trying to whip up has failed. Wike has no skeleton in his cupboard. "We will not take issues with a paradox like Amaechi who claims in one forum that he left N7.5bn (in the state's coffers) and in another, he said 10bn." Amaechi bobo, I await your reply..but you self, go na, prove to them that your hands are CLEAN. I like both of you fighting, but I'm tired of the 'mouth fights', both of you should use your hands, I will be the referee. On a serious note, if you're called before any probe committee, go. Quality content is the secret to interest the users to pay a visit the web site, that's what this website is providing. but I thought this post was good. I don't realize who you are however definitely you are going to a famous blogger in the event you aren't already. be careful for brussels. I will be grateful should you proceed this in future. You cerrtainly know hoow to bring an issue to light and make it important. More and more peoplee ought to look at this and understand this side of your story. It's surprising you aren't more popular given that you certainly possess the gift. post's to be just what I'm looking for. Do you offer guest writers to write content avaiable for you? I wouldn't mind producing a post or elaborating on a number of the suvjects you write regarding here. community where I can get responses from other experienced individuals that share the same interest. Unable to Change the Safety Settings in Fb account. Furthermore, The contents are masterpiece. you've done a wonderful activity in this topic! the subject matter is really great :D.
Good response in return of this matter with solid arguments and explaining the whole thing concerning that. and netball. Always enjoys traveling to spots like Town Hall and Roland on the Marketplace of Bremen. your mind this site and provides it a glance on a constant basis. 46 year old Paediatrician Nicole from Saint-Hyacinthe, has numerous hobbies and interests which include papermaking, Femnot.com and greeting card collecting. Gains motivation by making vacation to Zollverein Coal Mine Industrial Complex in Essen. Some truly marvellous work on behalf of the owner of this web site, utterly great articles.